Prim Perfect offer a free news service, to make submitting news stories to the magazine or blog even easier! As regular readers will know, our News from the Grid is an important and popular part of Prim Perfect magazine. You can use this special form to submit your news story directly to the magazine. All you have to do is to complete the simple form. If you want an image included, send it to primperfect@gmail.com. 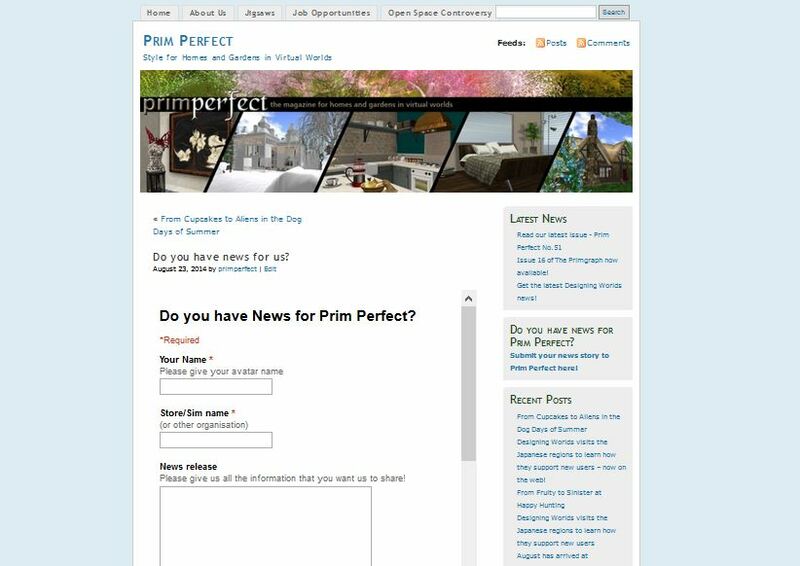 News stories will then appear in the next edition of Prim Perfect. The news story might also appear on this blog, especially if the story concerns, for example, the kind of time-defined event we like to cover – a special store promotion, or a charity concert. Previous Post: And Presenting . . . the Winners! Next Post: Night of the Starlets at Tribute Island! September 11 Never Forget..A Memorial in SL” is Proud and Honored to be Hosted by Regent Estates. September 11 Never Forget..A Memorial in SL” would like to invite you to participate in the reading of the names of the people who perished in the terrorist attacks of 9/11/01. The reading of the names will be played on the music stream at the New York , NYC Sim. Starting at 5 a.m. PDT SL . Please join us in honoring those that perished that day. Later on in the day @ 3p.m. PST SL, we will have a somber, Formal Dance. I look forward to seeing you all there. We start gathering for the reading at 5am and the first name will be read at 5:46am (slt) the time that American Airlines Flight 11 hit the north face of World Trade Center Tower One. The reading of the all 2,974 fatalities, excluding the 19 hijackers will take about 3 1/2 to four hours to read. We are also dedicating a new Memorial that day as well. The FDNY Memorial wall will be dedicated and placed on the side of Ten House that is already located on the sim. After the event, that parcel of land will be a place of reflection and remembrance. It will run a constant stream of the names. Many people have helped in this project from donating time to the reading of the names. Great looking Blog! Found it through Bing. Just as an FYI, it didnt display right when I opened it in the Opera Interet Browser. Hi! I’ve been following your weblog for a long time now and finally got the courage to go ahead and give you a shout out from New Caney Texas! Just wanted to say keep up the fantastic work!